This recipe comes from SheKnows Food & Recipes by Diana de Cicco. She gives some interesting cupcake baking tips and several unique recipes. 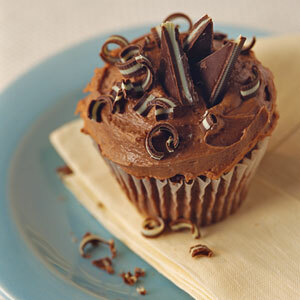 You know I love chocolate so I am linking to the Cayenne Spiced Chocolate Cupcake recipe. There is also a Citrus Glazed Rosemary Cupcake that I would love to try. Preheat oven to 350 degrees. Line muffin tins with paper liners. Combine flour, cocoa, sugar, baking soda, baking powder, salt, and cayenne in a bowl. Beat eggs, yolk, milk, oil, vanilla and water into flour mixture until fully combined. Pour batter into prepared muffin tins and bake 20 to 25 minutes checking frequently after 18 minutes. Let cupcakes cool completely before frosting. To make frosting, heat chocolate over a double boiler until fully melted. Set aside to let cool slightly. Stir together cocoa powder, baking soda, cayenne, and boiling water. In a separate bowl, beat butter with sugar and salt until fluffy. Beat in melted chocolate and cocoa mixture until fully combined. Spread frosting onto cooled cupcakes.